Escape to the Green Mountain National Forest and enjoy seasonal activities at this private chalet-style vacation rental. This 4-bedroom, 2-bath home sleeps 8-10 guests (depending on your party) and boasts a large fireplace, an updated kitchen with granite countertops, and a sauna to relax and soothe muscles after a day on the slopes. Walk home from the ski lift or your round on Stratton Mountain Golf Course, unwind with a drink on the front deck, then gather around the fire pit with loved ones! Located between the Stratton Golf Course and the main base lodge, this ideal family home allows you to walk to the fairways, slopes, village shops, restaurants, and more! Plus, the Stratton Mountain ski shuttle will pick you up at the end of the driveway for an even easier commute. Pristine hardwood floors and exposed beam ceilings guide you into your new home-away-from-home, featuring wall-to-wall windows for plenty of natural light. This home also comes kid-friendly, providing a playpen, kids toys, a booster seat, and more. 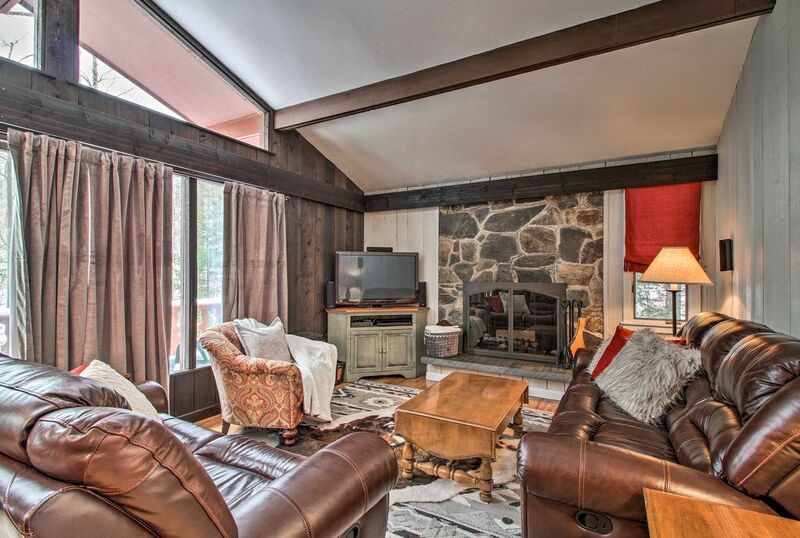 During downtime, throw some logs in the fireplace to get a flame started, spread out on the leather furnishings, and enjoy family favorites on the flat-screen cable TV with Apple TV streaming. You'll also find the sauna on the main floor; the perfect muscle therapy after a long day of skiing. Saddle up to the bar and keep the group's chef company as they prepare a home-cooked dinner. The kitchen comes fully equipped with granite countertops and all the essential appliances, cookware, dishware, and more. Share your feast at the elegant dining table, then finish your night gazing at stars around the fire pit. Drift to sleep in your choice of 4 comfortable bedrooms, and wake up feeling refreshed as you sip your morning coffee on the front deck. While you're walking distance to the Stratton Mountain Village and ski lift, the mountain shuttle will also pick you up at the end of the driveway - making it much easier to haul your gear. Other nearby ski areas for you to explore include Mount Snow, Bromley Mountain, and Magic Mountain. In the summer, walk just a quarter mile to hit the greens at the 27-hole Stratton Mountain Championship Golf Course. The Village also lies within walking distance and hosts a variety of shops, cafes, restaurants, and bars. Travel 30 minutes to hit the outlet stores in Manchester. And, if you're artistically inclined, the funky communities of Peru and Jamaica, Vermont are both within a 20-minute drive. - Stratton Mountain shuttle can stop and pick you up at the end of the driveway! Excellent Home! Walking distance to Stratton Mountain. Lots of thought put into what vacationers might need! Thank you! Will definitely come again! Excellent house very close to the mountain. We enjoyed this house very much for a family ski weekend. I will say that it is not easily walkable to the mountain so we had someone in our party drop us off each drive. It only takes 30 seconds to drive to the mountain. House was in good shape and well stocked. We could not figure out how to get the sauna to work but that may have been our fault. Beds were comfortable as was the sitting area. An outdoor Jacuzzi would be a good addition and there seems to be space for it. The first impression of the house was really nice - very cosy, comfortable leather sofa, soft blankets and great fireplace... until the night came and kids started running upstairs to scream there are strange noises which were coming from all over the ceiling where the old piping was attached. on top of that every 10 mins we heard the sound of an explosion as the boiler started up - kept me up half of the night! Perfect spot for a ski weekend at Stratton! Terrific ski house! Super Convenient! Excellent weekend at Stratton. Two minute drive to the mountain. By far the neatest and best organized ski house I've ever stayed in. Everything marked. Lovely living room, great kitchen with tons of little amenities. Small but neat bedrooms. Great toys for the kids. Owners make everything easy. Definitely recommend! This home could not have been more perfect for our stay at Stratton! We comfortably fit 6 adults, 1 child and 1 puppy. The house had everything we needed for our stay from a well stocked kitchen to great technology for our entertainment. The owners had all information well laid out for us to enjoy our stay and were more than accomadating and easy to reach! We will certainly be back!